Since the holiday season is around the corner, many people would be planning your travel. Many would like travelling in the free and easy style instead of tour now (totally agree coz it’s much more fun that way). So, it’s time to get that guide book and the ones sold in usual bookstores cost a bomb. Well, basically you can just get a rough guide book and the rest, you can look it up on the net…. The reason the books are on 50% discount is probably because the version is about 3 or 4 years old. However, I doubt there are massive changes during that time and it would be still a good buy. 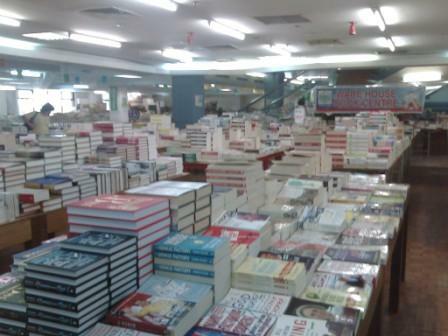 The ones sold at second hand bookstores are more expensive and some of these books are published years ago. 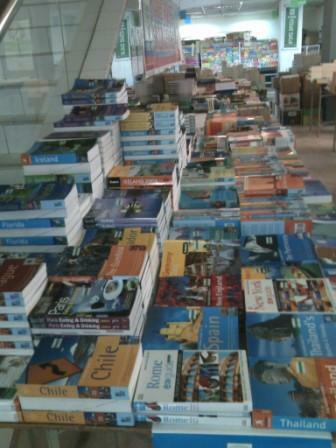 No promises that you can find the country that you want….but there’s tonnes of other books to see as well. Aside from that, language dictionaries are also quite reasonable. I bought my Rough Guide to Thailand for RM19.95 (I think that’s the only copy left) and previously when I was there, I bought a book, Perbualan Bahasa Thai Cepat dan Mudah (Conversation in Thai) written by Yazid Emwat for RM9.90. It’s a simple book, but useful.